After the surrender of the Yugoslav Royal army in April 1941, Serb soldiers throughout Yugoslavia set up Čete, or "bands," named after armed irregulars who had harrassed the Turks in the 19th century (detailed history, Wikipedia). The most important were those organized in the Ravna Gora district of western Serbia under Colonel Dragoljub (Draza) Mihailović. Mihailović directed his units to avoid large-scale fighting with the Germans (who exacted horrible reprisals for every act of resistance) and to wait for an Allied invasion that would liberate Yugoslavia and restore the monarchy. This cautious strategy soon led the Četniks into open conflict with the Partisans. Even after the Germans drove both forces out of Serbia, many Četniks occasionally joined German, Italian, and Croatian units in operations against their Communist rivals. The Allies, who at first considered Mihailović the pillar of the Yugoslav resistance, eventually shifted their support to the Partisans. By the end of the war, the Četnik were greatly reduced in number. Some retreated north to surrender to Anglo-American forces; Mihailović and his few remaining followers tried to fight their way back to the Ravna Gora to continue the anticommunist struggle, but they were beaten and dispersed by the victorious Partisans. In March 1946 Mihailović was captured and brought to Belgrade, where he was tried and executed. The flag used by the Četnik movement is a 2:3 black flag with a white skull and crossbones in the centre. Above and below the skull are arched writings in Cyrillic letters, "Za kralja i otadzbinu" (For the King and Fatherland) and "Sloboda ili smrt" (Freedom or Death), respectively. In recent years, Četniks reemerged as the leading power in the war in Croatia and Bosnia. The same flag was seen in many places occupied by them (usually volunteers), the most famous of them being Vukovar in 1992. Anyway, the flag, and the Četnik movement, is now connected mostly with Seselj, leader of the most rightist party in Serbia, the Serbian Radical Party. This is in no way the official flag of any legal movement in Serbia. The Serbian Četnik movement is illegal as a political party, and its founders, Vuk Drasković and Vojislav Seselj, divided into different parties with different flags. Demonstrators carry a black lag with a skull during a rally to protest Kosovo's independence from Serbia at the Heldenplatz in Vienna, Austria on 24 February 2008. Kosovo's parliament declared independence from Serbia on 17 February 2008. 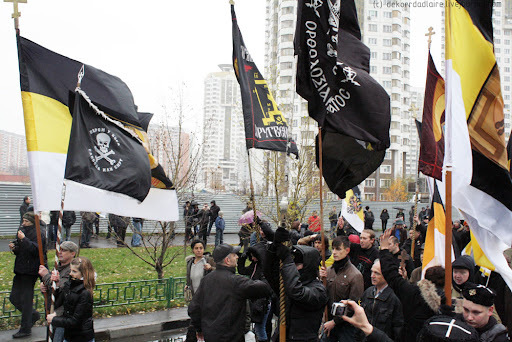 The "black flag with a skull" is indeed a Četnik flag, with a golden fringe. While the writing below the skull and bones reads like on the above image ("Freedom or Death"), the writing above the skull and bones is different, reading "Sa verom u boga" (With faith in God). A photo shows the said flag in use, most probably in Bosnia and Herzegovina during the war in the 1990's. The same flag was offered for sale on eBay (photo). The inscription is only slightly different - "S verom u Boga" instead of "Sa verom u Boga" - but the meaning is exactly the same. An unexpected use of this flag (photo) was in Moscow on 4 November 2011, during the Russian March, the annual manifestation of Russian ultra-nationalists which is held (not only in Moscow, but also in other yowns) on the National Unity Day, a national holiday in Russia Who brought the flag there was not said and all other flags seen on the photos are Russian, but the likely candidates are members of Russian Obraz, whose flags, modelled after those of the similar organization from Serbia, are seen there as well.